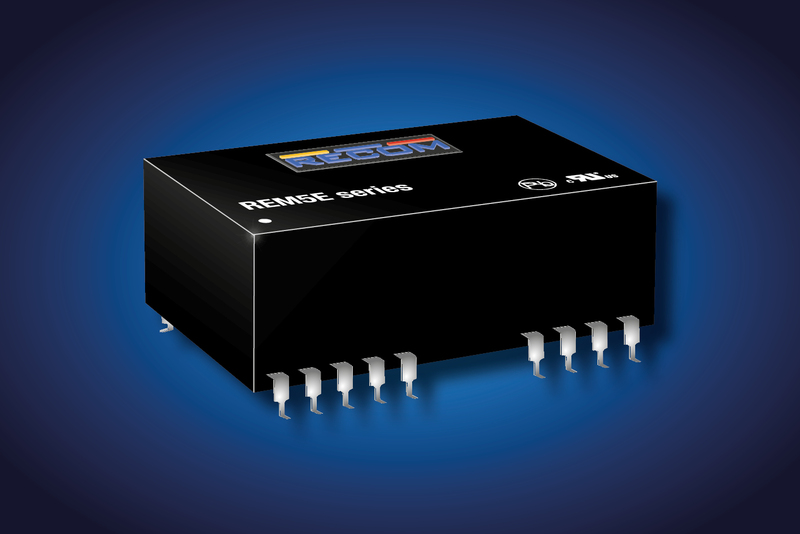 The REM3.5E, REM5E, and REM6E medical-grade, regulated DC/DC converters now come with either pins or as surface mount devices. They have reinforced 250V AC continuous working isolation with above 8.0mm creepage/clearance providing 2xMOPP (means of patient protection) and qualify for medical B, BF, and CF (Body, Body Floating and Cardiac Floating) applications due to the low 1μA leakage current. The reinforced insulation of up to 10kV DC is sufficient for virtually every medical application, confirms the company. The compact SMD packages have tightly regulated single or dual outputs with under-voltage lockout, short circuit protection, over-current protection and over-voltage protection. The modules operate at above 80% efficiency over -40 to 85°C without derating. They are UL marked and certified to CB, IEC, EN, and ANSI/AAMI 60601 3rd edition Safety and 4th edition EMC medical standards. Samples are available now from all authorised distributors or directly from the company.